The full moon is alive with manifestation energy. In my experience, some things came into full bloom. Firstly is my relationship with TLC Farm. I have stepped into a role of greater leadership and responsibility, helping to organize a beautiful event, the Bloom Festival, on June 8th. This just so happens to be my 25th birthday, which has not in recent years been an occasions of joy and celebration. Rather, it’s been a time for reflection, internal seeking and meditation. I am grateful that this year I can channel my creative energy into something of value to the whole community, whether they know “me” or not. This full moon manifested the final version and about 120 copies of the Bloom flyer, a huge hand-painted Bloom advertisement on Boonesferry Rd. as well as an event organizing mandala shaped like a flower. We’re prepared for bloom-off! If you feel called to post flyers anywhere in Portland or Vancouver, please contact me at awakeningcreatives@gmail.com. 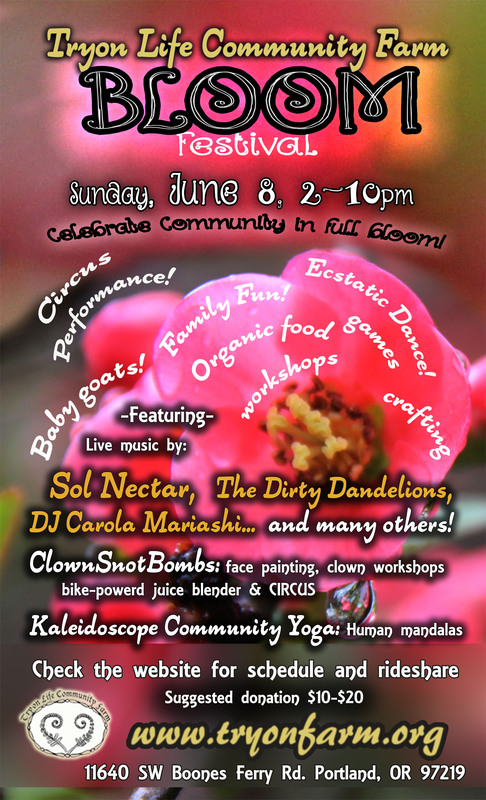 There are other awesome events coming up at TLC Farm. If you haven’t been getting a whiff of them, consider signing up for the email update which I’ve been getting out about once a month or so. You can email me or visit the website to sign up. Another act of blooming is that of my integrated practice of art, music, yoga, and service for the purpose of earth connection. I’ve been incubating the idea for Awakening Creatives for about a year now, developing a spirit of integral practice for awakening our encoded and unfolding creativity. Based on a theory that we are whole beings requiring a life practice that honors that wholeness, I am attempted to embody this. been experiencing visions of offering an integral yoga experience in the yurt and around the land at TLC Farm which incorporates art, music, yogic movement and service to the land (in physical and intellectual practices). I feel so alive in presenting this idea to you and would love feedback, resources and connections. My first assignment for the training is to write a 4-5 page yoga-related paper on any topic. I’ve chosen to focus on the issue of the re-appropriation of yoga for western purposes. This has come up several times when I’ve mentioned to friends my intention for seeking a yogic journey. I am particularly curious about your opinions about how yoga is and should be practiced in the west. If you have any links, resources, connections or stories, I would love to hear and discuss! The final bit of excitement blooming for me this spring is a new job position as an artist assistant for Corina Dross Artwork. Corina is a talented illustrator and painter who has been selling her art on Etsy and to radical shops around the country for the last eight years. Expect to hear from me about her work periodically, especially when new works emerge and about festivals and fairs where the art will be sold. This is the perfect job for me at this juncture in my unfolding. More art for the people!